Increase revenue through a high site performance ensured by proper cron jobs processing. 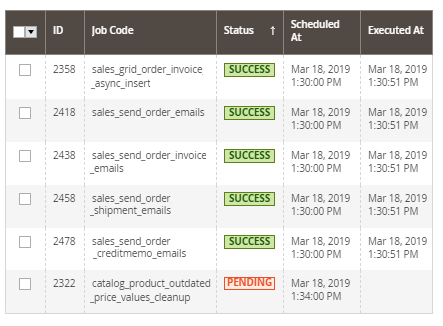 Efficiently track and manage all cron tasks running in the website background with Magento 2 Cron Scheduler extension. Get detailed info on each cron task: status, schedule, execution date, etc. Proper cron configuration is crucial for the correct website performance. It especially concerns vital features based on periodically scheduled activities, e.g. site re-indexation, export, import, generating Google sitemaps, Magento emails, etc. Also, managing cron jobs of both Magento and external modules requires strong technical skills and plenty of time. Make your website run at peak performance thanks to the efficient cron jobs management with Magento 2 Cron Scheduler. Find cron tasks execution errors in time and prevent all possible outcomes adversely affecting the Magento system. Easily manage all existing cron tasks running both by Magento and external modules on a single grid. On the timeline, you can view all running and scheduled cron tasks in chronological order. 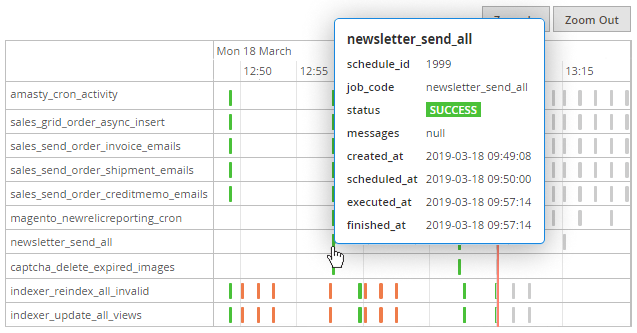 Each task is represented as a mark of definite color so that you can easily detect cron tasks execution errors alongside successful and pending tasks. Also, each mark has a definite width depending on a task processing time. 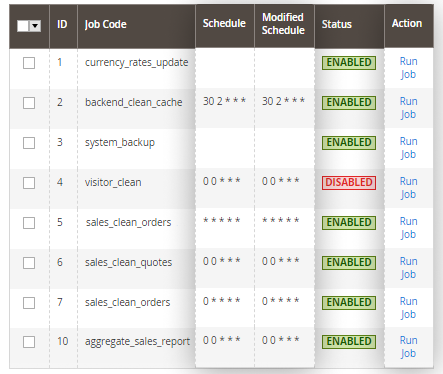 This helps you to define tasks which slow down other tasks work and timely modify the appropriate cron jobs schedule. Choose the most convenient way to handle the Cron Timeline grid. Use ‘Zoom in’ and ‘Zoom out’ buttons or hold ‘Ctrl + Scroll’ to scale the grid. Use ‘Scroll’ to move to the top or bottom of the grid. Start cron run manually any time it is needed by clicking the ‘Cron Run’ button. Also, obtain details on each separate cron task on the mouse hover (the status of task, its ID, the "Scheduled at" and "Finished at" date, time, etc.). Run all cron tasks and generate their schedule by clicking the ‘Run Cron’ button. Also, delete separate tasks in bulk, apply filtering and sorting options when it is needed. The extension gathers all cron jobs of third-party modules together with native Magento ones on a special Cron Jobs List grid. That’s why it is easy to monitor and manage the overall store cron work process. Also, the grid provides you with sufficient info on cron jobs, including a cron task status, group, schedule, etc. In case you find cron errors on the previous grids, here you can solve problems by reconfiguring the appropriate cron jobs. Easily change the frequency of cron tasks by modifying a cron job schedule right on the grid. Simply click on its record line and make the necessary changes. Start cron run and create tasks for a particular cron job any time you need by applying the ‘Run Job’ action. Cron timeline rules. It’s a good idea, just fixing detected troubles didn’t work with me. My store lagged the whole day, so I called support. Guys helped and explained fixing in details. Lessons learned. But profit still lost.